The wonderful Whitstable (Oyster Morris) Jack in the Green paraded through the town of Whitstable in Kent today. My thanks to Barry O’Brien for letting me use his pictures here. A Jack-in-the-Green was revived for the Whitstable Folk Festival in 1976 and is now central to the Whitstable May Day celebrations. The Jack is supported by Oyster Morris who also have their own Green Man who combines the roles of Jester and announcer dressed in white and green. The Whitstable Jack is accompanied by two attendants dressed as Robin Hood and Maid Marian. Dixie Lee one of the original organisers said in 1992 “At the time it just seemed like the Jack was looking for a reason to come out again, and I must say that every year when Jack makes his appearance on the street I get such a feeling of power from him that I know it was the right thing to do” After 40 years of reviving the Whitstable Jack, Dixie Lee retired in 2016 at the age of 80 and Oyster Morris took over the Jack and the procession. The Whitstable Times of 4th May 1895 included a report about a Jack in the Green catching fire on Whitstable High Street. Stephen Penn was in the Jack “encased in a pyramid of evergreens covered with thin colour paper…. “Jack” thought he would have a pipe and proceeded to light up” A spark from the pipe ascended to the upper part of the casing and caught alight. “He was instantly enveloped in flames” Fortunately the evergreens seem to have protected him and he only had his whiskers burnt off. His son Stephen Penn Jnr. however became ignited whilst attempting to help his father and was badly burnt, he was treated by the newly formed ambulance corps. A story circulated in 1977 that in 1912 the Whitstable Jack in the Green caught fire and the man inside burnt to death putting a stop to the tradition. There is no evidence of this and perhaps it is more than likely that the writer was in fact referring to the 1895 incident and perhaps embellishing it with their own memories of the 1973 film “The Wicker Man” for dramatic effect. In May 2016 Dixie Lee informed me of an addition to this story from a local lady that she knows well. Her Grandmother (whilst heavily pregnant) was walking to the shops when see saw the Jack catch fire. This caused such a shock that she went into labour. The result was a baby girl called May. May seems to have been unaffected by the incident and lived to the ripe old age of 99! I am indebted to all those who have sent in pictures of this years Jacks. The pictures accompanying this post are of the wonderful Whitstable Jack-in-the-Green, thanks to Joe Eddington for the photographs and to Dixie Lee for getting them to me. 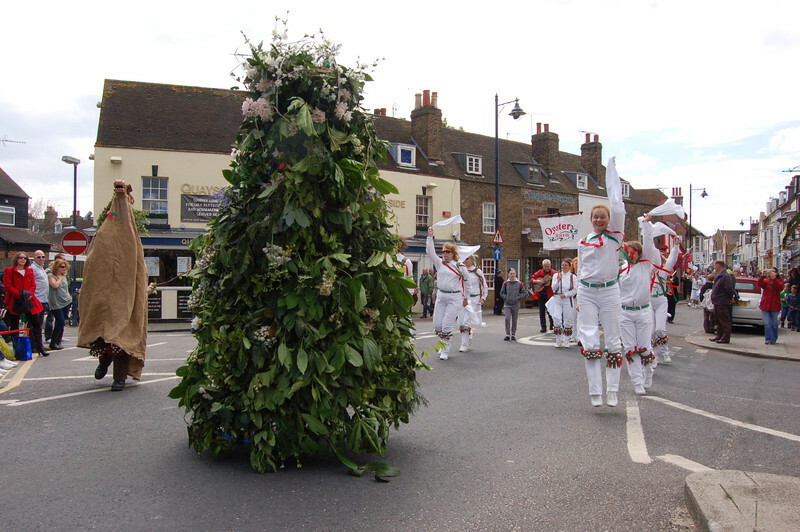 A Jack-in-the-Green was revived for the Whitstable Folk Festival in 1976 and is now central to the Whitstable May Day celebrations. The Jack is supported by Oyster Morris who also have their own Green Man who combines the roles of Jester and announcer dressed in white and green. The Whitstable Jack is accompanied by two attendants dressed as Robin Hood and Maid Marian. Dixie Lee one of the original organisers said in 1992 “At the time it just seemed like the Jack was looking for a reason to come out again, and I must say that every year when Jack makes his appearance on the street I get such a feeling of power from him that I know it was the right thing to do” The Whitstable Times of 4th May 1895 included a report about a Jack in the Green catching fire on Whitstable High Street. Stephen Penn was in the Jack “encased in a pyramid of evergreens covered with thin colour paper…. “Jack” thought he would have a pipe and proceeded to light up” A spark from the pipe ascended to the upper part of the casing and caught alight. “He was instantly enveloped in flames” Fortunately the evergreens seem to have protected him and he only had his whiskers burnt off. His son Stephen Penn Jnr. however became ignited whilst attempting to help his father and was badly burnt, he was treated by the newly formed ambulance corps. A story circulated in 1977 that in 1912 the Whitstable Jack in the Green caught fire and the man inside burnt to death putting a stop to the tradition. There is no evidence of this and perhaps it is more than likely that the writer was in fact referring to the 1895 incident and perhaps embellishing it with their own memories of the 1973 film “The Wicker Man” for dramatic effect. In May 2016 Dixie Lee informed me of an addition to this story from a local lady that she knows well. Her Grandmother (whilst heavily pregnant) was walking to the shops when see saw the Jack catch fire. This caused such a shock that she went into labour. The result was a baby girl called May. May seems to have been unaffected by the incident and lived to the ripe old age of 99! It has long been my hope to be able to obtain at least one picture of every Jack that goes out across the UK each year to add to our online Flickr archive and provide a visual record of this wonderful tradition for generations to come. I’m still trying to track down pictures of a number of Jacks from this year. If you can help and have the copyright owners permission please get in contact via the ‘Contact us’ tab at the top of this blog. Copyright of any pictures added to our archive always remains with the original photographer and pictures are only ever used with permission of the copyright owner. The Whitstable Jack-in-the-Green went out on Monday 7th May 2012. The Jack was supported as always by Oyster Morris. Our congratulations to Dixie Lee who revived the procession in 1976 and was presented with a wonderful wooden plaque to commemorate her retirement. I had hoped to make it to Whitstable myself this year but sadly the bank holiday traffic put a stop to that!…next year! I’m extremely grateful to Quentin Fletcher for giving us permission to reproduce his wonderful pictures of the Whitstable Jack for another year.